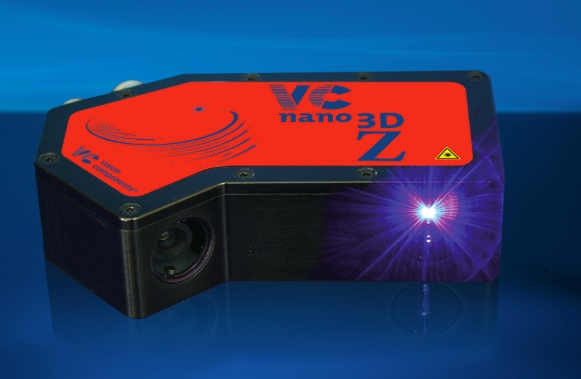 Vision Components has developed new 3D laser scanners. Dubbed the VCnano3D-Z-series, they contain a Xilinx Zynq SoC, which comprises a dual-core ARM processor and an FPGA. In order to determine line coordinates in laser triangulation, a point cloud has to be calculated. In the new sensors, this is done in the FPGA – the programmable circuit processes large amounts of data. Thus, full processor power remains available for application-specific tasks. The laser profilers provide scan rates of up to 2 kHz. Featuring a 1-Gbit Ethernet interface, they are suited to real-time applications in robotics, for example, for welding robot guidance and adhesive bead tracking. The system integrates a class-2-rated, high-intensity blue 450-nm laser. Thanks to Ambient Light Suppression Technology, it can be used with ambient light up to 100,000 lux. This novel technology ensures optimal visibility of the laser line even on especially challenging surfaces. In addition, the blue laser is suitable for food applications such as volume measurement in slicing and packaging stations. The series includes various models for different working distances from about 60 mm to over 3 m. The range of possible resolutions is therefore enormous, too: resolutions up to about 40 µm on the X axis and 10 µm on the Z axis as well as over 2000 mm wide visual fields are possible. Latest generation CMOS image sensors ensure image quality with minimal noise. The company also handles special requests to build customised laser profile sensors in a short time.